- Capt. Koch is the Chairman, CEO and a Partner of Oesterreichischer Lloyd Shipping Group. - He received his diploma in Nautical Sciences (Dipl-Naut.) at Hochschule fuer Nautik in Bremen (University of Bremen) in 1974. - Capt. Koch has extensive industry experience as a Captain, Manager and Owner. From 1977-1984 he served as Manager of  Transport / Business Admin for VEBA OEL AG Group (nka EON) and from 1984-2001 he was Managing Director at Krohn  Shipping Group in Vienna. - Capt. Koch joined Oestereichischer Lloyd as a Partner in 1991 and became Chairman and CEO in 2001. - Capt. Koch is a Member of the Advisory Boards of both DNV GL, Cyprus and CCS Mediterranean. - Capt. 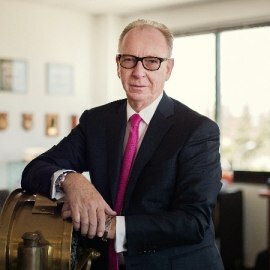 Koch is the Chairman of the Board of Governors of the Cyprus Maritime Academy.